Bar and Grill Virginia Beach: Treating Mom! 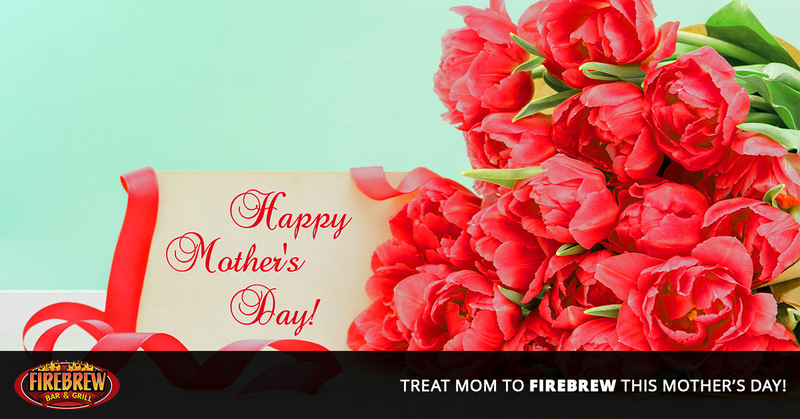 Treat Mom to FIREBREW This Mother’s Day! We all love our mothers, which is why we can’t wait to help you and your family celebrate Mother’s Day at FIREBREW bar and grill! Not every bar and grill is the same, and that is especially true of FIREBREW. Each of our meals is made in our 600+ degree open fire oven; there isn’t a single fryer or microwave to be found. We also can’t wait for you to see our open concept restaurant with our kitchen right in the middle. You can watch your food being prepared while socializing with those you love most, including Mom! We’d like to share the top ways to pamper your mom on Mother’s Day this year, so read on to learn more! Don’t let her pick up a single dish! Whether the laundry needs tending to, the living room needs to be dusted, or the toilets need to be scrubbed, we are sure you can handle it. Taking care of the tasks she so selflessly handles each and every day is a great way to show her that you appreciate all the hard work she puts in for you and your family. Whether you are looking to treat your loving wife who mothers your kids or your own mother, get the younger kids around involved! Have them bring her breakfast in bed, or take them to the flower shop and let them select a beautiful bouquet to present her. If you’re giving the mother in your life jewelry for everything she does, then have the kids follow up with a homemade necklace or bracelet. We promise that she will love it. Whether pampering means a day at the spa or even just some at-home beauty treatments and a nap, find a way to spoil her! Even working with a budget is possible when trying to make the mother in your life feel special. A nice walk outdoors or perhaps at at-home manicure might be just what she needs to feel special and loved. What does she like to do most? Whether that is enjoying a day in Virginia Beach exploring or taking a soothing nap, make sure to let her have just what she wants. A day of busy activities calls for some time of rest! Don’t hesitate to allow some time for everyone to just sit around and enjoy each other’s company. Good conversation and fun memories are better than most gifts money can buy. It can be a bouquet of her favorite flowers, a piece of jewelry, or maybe just a toaster she’s had her eye on for awhile now; whatever you choose to give the mother in your life for Mother’s Day, we are sure that she won’t be disappointed. Treat this day like a special occasion and let her know how much she is truly adored. Not to brag too much, but we know that FIREBREW Bar and Grill is the perfect choice for Mother’s Day. Why is that? We have food that the whole family will love. If you want to share a pizza or two, we can do that for you. All of our food is cooked fresh right in front of your eyes! Instead of using fryers and microwaves, everything we make is made in our 600+ degree fire deck oven. Treat her to a delicious and fresh meal with her favorite people surrounding her! Not to mention, we also offer a self-service wine bar where she can choose her favorites and sample the rest. If you would like to learn more about how we can turn your dining experience into a delicious treat for Mother’s Day, contact us today! FIREBREW Bar and Grill is here for you. We know how much you love your mother, so why not treat her to a special day to show her how much you love and appreciate her? To all the moms out there who raised us and take care of us, we would like to say thank you! We will see you for dinner soon!